Sorting and filtering options make it simple to find and select candidate databases for archiving. As soon as the database is added to the work queue, archiving starts in the background immediately. Super quick and easy to set up, you'll be archiving your first database within 5 minutes after installation. Open XML format allows long term storage of data and design with no need for recurring runtime or server costs, and no tie-in to any vendor. Archives can be explored with any XML reader. Unlike CSV archives, the XML format faithfully represents rich text and file attachments. If you've ever wished you could just export Notes databases to CSV and maintain rich text and attachments, this is the answer. The XML archive includes both the data as well as the application design, encoded using IBM's well documented DXL format. So, if necessary, you could even regenerate Notes databases from the XML archives. Inclusion of design in the archive is important for regulated environments - you may have to prove that certain checks or features existed in the original application design at a much later date. The self contained, read-only HTML representation allows users to browse archived data in a very familiar format - even views are reproduced, including categorization. The HTML representation stands alone and can be viewed with any browser, with no need for a web server. And, you can easily import archives into Microsoft SharePoint just by dragging them into SharePoint Designer! Archiving to both XML and HTML formats provides maximum future proofing at minimal cost with free access to nicely formatted, searchable data for users. Contact us to schedule a demo, request pricing info or just learn more about Teamstudio Export. Export is easy to install. A stand-alone Windows app, just install it on a workstation that already has IBM Notes on it. As long as you have a Notes ID that has access to all the servers and databases that you want to archive, you'll be archiving in no time. 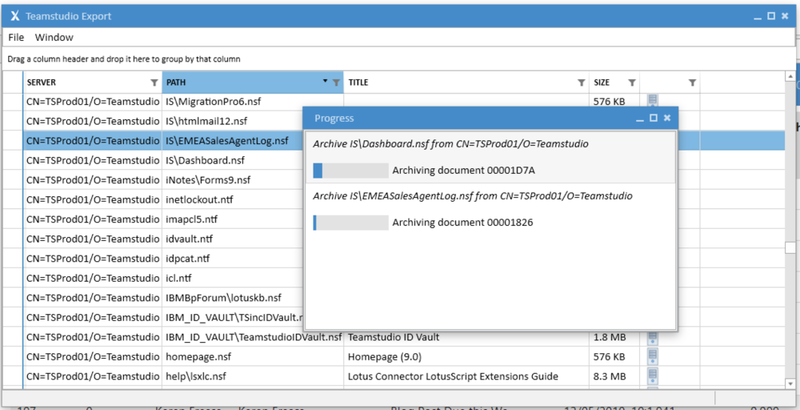 Sorting and filtering make the task of locating your archive candidates simple. As you locate each database to archive, right click, select Archive, and the job is added to the work queue. Archiving starts in the background, allowing you to move on to the next candidate. As the archiving jobs complete, simple, clear icons in the main screen show you which databases have been archived. Once a database has been archived, you can convert it to HTML format. This creates a standalone, read-only, HTML representation of the database that can easily be navigated by users, using only a browser. You don't even need a web server! The thing about archiving a database is that you never know what you are going to need until you need it. And by then, it's usually too late. That's why Teamstudio's approach to archiving is to save everything - just in case. Storing archives in XML format allows us to save everything - field data, rich text including formatting, file attachments, even the database design. And it's all stored in text-based, non-proprietary format that can be read by any XML reader. So, no tie-in to any vendor (not even us!). No need to pay royalties or subscription fees. Just Export your databases and store them somewhere safe, just in case you need them in the future. If you work in a regulated industry, you may need to be able to prove that your code had a certain feature built in. All the code is stored, along with everything else, just in case. Once you've created your XML archive of a database, you can quickly create a stand-alone, HTML representation of it. Users can then easily navigate the archive, using nothing but a browser. Database views are reproduced, including categorized views. All fields are surfaced in the form, rich text is faithfully reproduced, and attachments can be downloaded and opened in the normal way. You didn't hear this from us, but some people have commented that the Teamstudio Export HTML representation is better looking than in the Notes client! The primary use of an archive is to allow users to go back and find data that didn't get transferred into the new system. Teamstudio Export's HTML based browsable archives allow users to do just that, with zero recurring cost. You don't even need a web server! And, if you're migrating to Microsoft SharePoint, you can easily import your HTML archives simply by dragging them into SharePoint Designer! 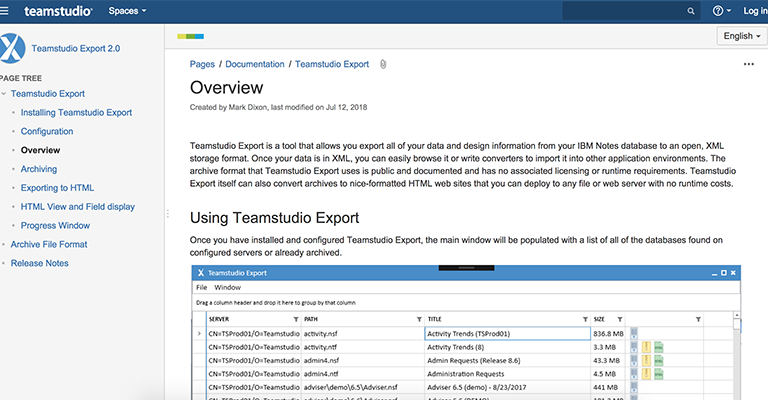 Watch a short, 3-minute demo of Teamstudio Export. Want to delve deeper into the nitty gritty of how Export works? Click the image to read the User Guide!